Some of us ride for recreation, some for transportation, some for both. All of us sometimes need to transport stuff when we're on two wheels. Most scooters have some amount of storage (unusually under the seat) and most motorcycles don't. There are all sorts of options from messenger bags and backpacks to bungee cords to luggage. We're going to take a look at one of the last category - a topcase from SHAD. The most widely recognized aftermarket topcases are from Givi. They are very good quality but tend to be pricier than SHAD, and I like the latching and locking mechanism of SHAD products better than Givi. I have owned both brands and would say that quality is equal, but I'll admit that I have a lot more SHAD cases (price/value) in my garage. Back in June, we reviewed the SHAD 40 liter case. For a lot of scooter riders, that's the biggest case they would want (most select a 29 or 33 liter size). We heard from a lot of motorcycle riders asking about something bigger. The SHAD 48 easily holds two full-face helmets and looks great on a lot of motorcycles. The SH48 shown here came from Scooterville in Minneapolis - the local SHAD dealer - and has a retail price of $299. For comparison, a comparable Givi has an MSRP of $329. It came with a mounting bracket and hardware. One of the nicest things about SHAD cases is the relative ease of installation. If your motorcycle/scooter has a rear luggage rack, it's probably going to take you less than an hour to install a SHAD case. 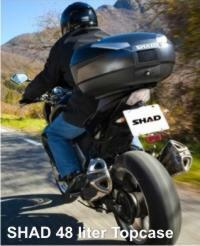 SHAD also offers fittings that are motorcycle specific. 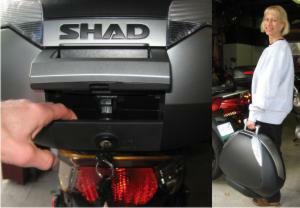 For example, if you have a Suzuki SV650S and want to add some luggage, SHAD has you covered. 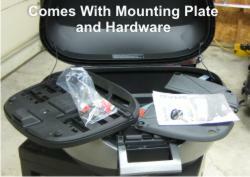 If you already have a place to put it, installing the mounting plate is straightforward. Set it on the rack, align it, install the appropriate hardware, adjust, tighten, and install the cover plate. SHAD case come with a pretty good basic instruction sheet. When done, the mounting plate looks clean and neat for those times when you want to ride without the case. The SHAD 48 liter topcase has a three-position key lock that works very well and offers a feature that many other cases do not. In the "Close" position it is locked shut and locked onto the mounting plate. In the "Open" position, the topcase can be opened and closed, but it is locked onto the mounting plate. In the "Release" position, the case can be removed from the mounting plate. In most comparable cases, they require the key to open. I don't know about you, but there are plenty of times when I want to get in and out of my topcase. When I'm loading up for a weekend ride there always seems to be one more thing I want to bring. Being able to get in and out of the case without the key is handy. Of course I lock it closed when I'm riding. Turn the key to the "Release" position and one can release the latch from the mounting plate and carry the SHAD topcase like a suitcase with the built-in handle. To open and close the case, have the switch in the "Open" position, press in on the switch itself. The handle will pop up. The opening release is just under the handle. 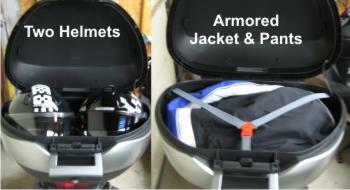 There is plenty of room inside the SHAD 48 liter topcase. Two of XXL full-face helmets fit easily. There is also an elastic retaining strap inside the case. I was able to fold up my armored riding jacket and pants, hold them in place with the strap, and have room for my messenger bag on top of them. Once closed, the SHAD topcase does an admirable job of protecting your stuff. I ran the garden hose over the case and the contents remained dry. 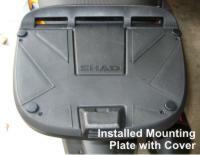 Quality of construction and materials in the SHAD topcases is excellent. I have several of them ranging from 29 liters to 48 liters on different scooters and motorcycles and they all have held up very well over time. At under $300 and large enough to act as weekend luggage, the SHAD 48 liter topcase is an excellent value. You can find SHAD products in the Twin Cities at Scooterville in Minneapolis.